Unlike most NFL prospects, Stefan Charles did not play his college football in the United States. He starred for the University of Regina and is a native born Canadian. I briefly covered Stefan Charles in the not so distant past. It’s hard to scout Charles from his available footage, but what I saw of him in drills he looked like a special athlete. The way he moved I assumed he was 280 pounds. He played at 324, and posted a mind-blowing 37″ vertical at that weight. I bet his feet hurt. Charles played for the same school that produced mid round defensive lineman Akiem Hicks last season. And not that it has anything to this, but it’s also the same school that Jon Ryan played for. I like Charles quite a bit, but I’m hesitant to make a declarative opinion on him as I’ve seen so little. In terms of athleticism though, I think he’s probably one of the better options in this draft, at least on par with Montori Hughes, John Jenkins, and Brandon Williams, if not superior. If Seattle selected Charles in the 3rd round, I would not be shocked. Williams was a minor star on the Nevada Wolf Pack defense the last couple seasons. Despite being one of the lightest strong safeties in this draft (190 pounds or 203 pounds depending on who you ask), the 5’11” defender is among the biggest hitters. I doubt he’d ever dominate physically as Kam Chancellor does, but there is a lot to like about a strong safety who can run in the 4.4s and play a physical brand of football. Williams is fundamentally sound, explosive in small spaces, and a sure tackler. Not only do I think he’s likely to start in the NFL if given a real opportunity, but I could even envision him as a starter in a future pro-bowl. He’s undersized, but he has a lot of talent. He also makes a lot of “splash” plays that get noticed by fans, and he’s got quite a bit of swagger to his game. Williams would be a good pick in the middle rounds, though I think he’s perhaps more like Jeron Johnson than Kam Chancellor, though Williams is faster than both. Kevin McDermott is a longsnapper. I could probably just stop there, but I’ll add one more thing: don’t do a google image search for Kevin McDermott. Unless you like that kind of thing. I was surprised when I saw Batton make the visit list. His tape is pretty good, don’t get me wrong. But at 5’10¾”, 228 pounds. He’s very undersized. He also ran a 4.74, making him one of the slower linebackers in the draft. It’s very tempting to compare Batton to Lofa Tatupu, who had similar measurables when he came out but made up for it with sound fundamental play, a burning intensity and natural leadership. Batton seems like a Tim Ruskell type pick. Batton probably won’t be drafted. Perhaps Seattle views him as competition for Heath Farwell on special teams. Maybe they want depth at middle linebacker? I have to assume they had this visit before trading for Percy Harvin. All it really tells us is that Jones fit the profile at defensive tackle that Seattle was seeking at the time. I like Datone Jones as he has great upside- the best defensive tackles are usually very fast- so this visit instills confidence that Seattle is looking in the right places on the defensive line. Aside from having an ongoing drug problem and having the fashion style of some generic bad guy from Streets of Rage or Final Fight, there are sane reasons why Seattle would use one of their team visits on the troubled defensive back. Consider this interview he gave back in January. It may not be entirely coherent, but you can sense a heart for the game in Mathieu’s words and a passion to pursue an NFL dream. By bringing Mathieu in and talking to him face to face, they might get a better feel for whether he’s capable of growing out of his drug problems and immaturity. Having Mathieu in doesn’t necessarily mean Seattle has interest; if anything it’s a means to gauge interest. I consider myself neutral on Mathieu. I never bought into his hype during his Heisman nominated 2011 season, but I didn’t jump on the hater bandwagon when his problems surfaced in 2012, either. As a prospect, I think he’s probably worth a 4th round grade, at best. Even during his 2011 season, most of his big plays were fumbles that slipped out inexplicably or bounced right into his hands. Am I to believe that he has a talent for making offensive players play badly, or making the football bounce right into his hands? He also had quite a few impact kick returns with what turned out to be so-so speed (Mathieu ran an official 4.50). It’s unlikely that he’ll continue to be a difference maker in the return game against NFL teams, especially since I think his field speed looks slower than his combine forty would indicate. You take away those big plays, which seemed more fortunate than forced, and you are left with a close to average defensive back, in my opinion. A defensive back that stands just 5’8¾”. Out of 60 defensive backs that attended the combine, only Greg Reid from Florida State measured shorter. Seattle proved with the Antoine Winfield signing and their alleged interest in Robert Alford that height is not an absolute requirement, though Winfield plays with more physicality than most six foot corners do. Mathieu relies on arm tackles too much, and while he plays physical, the lack of size and strength shows up on tape and I think could be an area where he gets exposed in the NFL. There are also times when he seems to shy from contact on runners that are going full speed. He’s nothing amazing in coverage, and looks like he’d get eaten alive against big receivers with jump ball skills. Mathieu’s speed is actually below the median in this cornerback class, too. Mathieu is not a terrible player. He was a solid college player that was overhyped because he was involved in a lot of splashy big plays. I guess my worry with Mathieu is that he’ll suffer from the NFL jump more than most players would because he’s already playing at his physical ceiling, and even at that level I’m not left seeing stars. Slightly above average college players become career backups in the NFL unless they have remaining physical upside to tap into. Even if I am wrong and Mathieu finds a way to improve his game enough to offset the jump to the NFL, he will almost certainly be a nickle corner only with a profile like his. Remember how tiny Kelly Jennings seemed when covering big outside receivers? Kelly Jennings was 5’11”. Notice how I’ve barely talked about Mathieu’s drug problem? This is why I wouldn’t be terribly shocked if Mathieu went undrafted. Reputation may matter to fans and to awards ceremonies, but it doesn’t matter to scouts. All scouts see is a good college player with very little untapped upside, a low NFL ceiling, and massive character risk. If he’s drafted before the 4th round, I’d consider it an upset. 6’0¾”. 209 pounds. 4.56 in the forty. Played strong safety. I think the video above tells you all you need to know. The video, a “highlight tape”, is dominated by special teams plays. Fans that make highlight videos almost never include special teams plays, because fans usually don’t care about them. So why are they in there? It’s specifically to appeal to NFL franchises searching for a special teams ace. As soon as I noticed how special teams heavy the video was, I immediately checked to see who posted the video. It was posted by Brendan Melanophy. Yup, it all makes sense. I hope that didn’t sound condescending, because I like what Melanophy brings and I like the implied sense of humility that he’ll do what it takes to make it in the NFL. Seattle has had one of the best special teams units every single year under Pete Carroll and a big reason for that is how he values special teams specialists on his roster. Seattle also needs more roster churn at strong safety, and Melanophy has the size and physicality that Seattle likes in the defensive backfield. I doubt Seattle would draft Brendan Melanophy, but he’d be a good get in undrafted free agency and bringing him in for a visit helps Seattle’s chances. Similar to Jeremy Wright, Murray has a lot of length (meaning he has long legs), which I generally consider a drawback for a running back. I wasn’t a big fan of David Wilson last year because his long legs robbed him of short area quickness despite having top shelf straight line speed. Murray is a similar story. In tight spaces he looks almost geriatric. But on a swing pass with plenty of green ahead of him his speed becomes plainly evident. I’m not a fan based on his tape, but it’s hard to argue with Seattle’s interest. 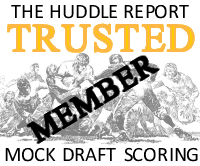 Murray is just a shade under 6’3″, weighing 223 pounds, and he ran a 4.38 at his pro-day. He also posted a 36″ vertical and 10’6″ broad jump, both of which are excellent for his size. He’d make an interesting receiver convert, if that’s the angle Seattle is taking. Standing 6’5″ but just 230 pounds, Ryan Otten is probably the lightest draftable tight end in this draft class, with even featherweight Jordan Reed beating him by six pounds. That probably explains why Otten has the physique of an Ed McCaffrey. Otten did post a 4.64 forty time at his pro-day, making him one of the faster “tight ends” in this draft, though he’s probably more natural as a big receiver at this point. If Seattle does view Otten as a tight end, it would hint towards them favoring a pure H-back. If so, that would make Jordan Reed a player to keep a close eye on in rounds 2-4. A couple months back I watched every game compilation I could find of Patton, and to be honest, I thought he was the most vanilla receiver in this draft on tape. But now I’m watching his highlight videos as due diligence, and I’m surprised by what I’m seeing. Sure, highlight videos are not ideal as a scouting tool, but I’m seeing athleticism and eye popping displays that never showed themselves in the game compilations I watched. Is it possible I just drew a bad sample? Because his highlights (as well as his interviews) paint the picture of anything but a vanilla receiver. I think Seattle’s interest in Patton is almost certainly legitimate, and I doubt they’d bring him in for a visit if they had a 4th round grade on him. They’d be fortunate if Patton reached their selection in round two, and they’d have to know that. Patton has good but not elite size (6’0, 204), and he has good but not great speed (4.53). Patton does display excellent concentration skills and body control, and he has good moves after the catch which helps compensate for his ordinary speed, making him a comparable prospect to Keenan Allen. Though on paper Patton profiles as an NFL average #2 receiver, players like Darrell Jackson and Greg Jennings have posted multiple 1000 yard seasons with near identical measurables and skill sets. Both Jackson and Jennings excelled in west coast offenses due to being great route runners with a strong grasp of the fundamentals. Patton possesses those skills as well. This leads me to the one thing I actually really like about Patton: his intangibles. His personality has a spark to it that reminds me of Richard Sherman. Playfully cocksure. The jump to the NFL is notoriously difficult; having confidence and self-belief can make a big difference in how far a prospect makes it. His game tape may be bland, but his highlights impress and his personality makes me want to believe. Though he lacks elite speed, and isn’t tall enough to be a Sidney Rice type, I’d say he definitely fits the John Schneider profile as he has very good yards after catch ability and has excellent possession receiver skills. He also has the kind of playful yet driven attitude that fits in perfectly with Pete Carroll’s team dynamic. turns out, I’m not into that stuff. Google got me too. lol. Stefan Charles seems a little to gifted to make round three even. It’s a copy cat league and this year the Hawks are quite popular, We aren’t going to be the only ones looking for that seahawky vibe. Do you really believe Stefan Charles will be drafted in the 2nd RD? From everything Ive watched on him and scouting reports, he realisticaly seems more like a mid RD pick to me, but could be wrong. I walked straight into that one. I love Melanophy as a special teams player. Wouldn’t mind spending one of the four 7 rounders on him. Who’s the RB for San Jose State?? He caught my eye in the tape. And could Duke Williams convert to nickle? I like his value in the middle rounds but you’re right, he doesn’t have a spot on the team right now. I was wondering if Williams could move to Free Safety with his speed. I would feel a lot better if they had someone who could step in for Thomas and be half as effective. Well…. considering Rob and Kip have made it pretty clear that they wouldn’t mind Patton in the second. I think he would be their pick. Patton without doubt. Rogers too much of a headache. Dobson was the third most productive receiver on Marshall’s roster last season. Rob would you rather have Patton in the 2nd RD or are there a few WRs that are more likely 3rd-4th RD projections that have simliar value to Patton? I guess what Im asking is do you or KIP feel like perhaps there more than enough talent seperation in a guy like Patton to justify our 2nd RD pick versus value seperation in other WRs that can be had a RD or two later? Just strikes me that theres so much value @ the WR position in this years draft that marginal skill and talent can seperate two similar players by a RD or even multiple RDs. Bottom line is you always want to get the most bang for your buck regardless who that player is or where hes drafted. Thoughts? I think there are other receivers I would happily consider in round three or four. There are alternative receivers I’d consider in round two. The Seahawks don’t ‘need’ to go after Patton at #56 if he is there. I just have a hunch that they’ll really like him and maybe target him as one of maybe 4-5 players they’d be prepared to take in round two. Dobson: Dobson’s numbers have a lot to do with his QB’s play, not just him. The QB spread the ball around in their fast pace system. He drew the coverage off the other receivers, plus played through some injuries. He was their #1 though, and a team captain. He was usually the opposing defenses focus point. Especially in the red zone and on third downs. Dobson’s actual numbers suffered from the threat of coverage. He is just as athletic as Patton. Bigger, stronger, and faster than Patton actually. Runs good routes, finds open spots in coverage, is able to separate, and has probably the best body control plus hands combo, available in this draft at WR. He made multiple amazing catches in his college career. Basically, I am of the thinking that the other receivers stats, indicate that Dobson was able to draw the focus, and was a true #1. He was their best receiver, and didn’t complain about not getting the ball. His carrer stats show he was productive. This past year was his worst year outside of his freshman season, statistically. He could replace Sydney Rice as soon as next season. He may be available with our third round pick. Yeah I liked all the film Ive seen on Dobson. Nice notes Maz. What do you think about Da’Rick Rogers as a WR (not the off field stuff)? Would be my first choice. A comparison between Dez Bryant and T.O. 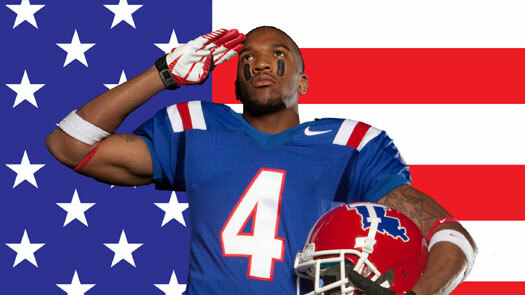 If we miss out on WR in the 2nd, I wouldn’t hesitate to select Da’Rick in the 4th if he is there for us. Even with his issues. Not sure our FO would agree, but I think the risk is worth it there. The 5th round would be ideal I think. Don’t think he will be there then though. I’d say Rogers if he didn’t have the off-field headaches, I like his YAC ability on tape. I don’t really see much in Dobson. Patton kind of gives me a Djack/Jennings vibe. My guess is that Patton goes on to be the most productive of the three. Dobson and Rogers have a pretty high chance to wash out completely, albeit for different reasons. And there is Harrison out of Rutgers, a 6′-3 WR who is also very productive. He could be converted into a Joker TE/ WR as needed. I am not a Honey Badger fan. I have a hard time understanding all of the love for this guy. Stefan Charles is an interesting guy. You can never have enough big linemen. We will find a few gems in the middle or late rounds. This is where Schneider makes his money. Charles, could be this years Brandon Browner, a Canadian player that everyone overlooks. When PC/JS become convinced they can find a starter in the middle to late rounds it affects the top of their board making it impossible to predict who they will take. I’m a fan of Charles too, and I think he fits what Seattle wants the best of all the tackles that will likely be available. I wouldn’t be shocked if they took Charles at #56. I had the same reservations about Patton as you, Kip, but the more I see of him the more I like him. He’s a crafty player. He gives some pretty fakes when running routes and juking. Really impressive ability to make players miss. I wish he had more jump ball opportunities last year, but usually didn’t need to. He gets great seperation because he’s quick off the line and beats the press like no-one in this class. I’m not sure his speed is going to be a great asset at the next level, but he is decent in that area. Great hands, too. Long arms. I’ve seen some places that he’s 6’3 and others 6′. I’d say it’s about 6’1.. I like him more as a Sidney Rice player. The crafty route runner that gets seperation and wins 1 v. 1. I know he’s been mentioned as a Golden Tate replacement, but I just don’t see the same short area quickness and RAC ability. I’d rather have Tate and Patton than Rice and Patton. Thoughts? Also, do you see Swope as an outside receiver, or a slot guy? Agreed about him beating the press. For the first couple seconds of every play he’s arguably the best WR in the draft, which makes him a great fit for a WCO. I think Swope is going to be better in the slot, but he can play outside just fine. Want to thank ya Kip you gave me the last piece for my mock draft. You showed me a Steve Tasker type player that could possible be coached to add depth for E.T. spot. Stefan Charles is one of the players I’ve had problems placing in my draft. There not enough tape and not much comment on him other than his size and that’s one reason he falls where he’s at in my draft. I watch as much tape as I can on these guys and then sometimes its a scouts comment that can tip the scale as to me picking him. I write them down so I thought I’d share some of those that help me pick these guys. Plays with a fearless attitude. Aggressive blocker that plays with a Gladiator Mentality. No comment but there was talk of banning him from BCS Bowl for hit on QB. pick 194 Stefan Charles DT Canada, 6’5″ 310lbs. No comments that I saw. I like mean, nasty players they seem to have the heart of the game. I’m I’ve missed with some of these guys but it was fun doing it. Thanksfor these Kip. Awsome information. In fairness to Mathieu I think two of your criticisms can be explained by his penchant for going for the strip. He doesn’t seem to shy away from contact and most of the time he goes for an arm tackle he is also trying to strip the ball. Also most of the fumbles that seem to bounce his way start with him stripping the ball. I’m also A LOT higher on his return ability than you but to each his own. Thanks again for all the work you guys do. It works though. He said he led LSU in tackles. Could it be better? Yes, but It works. 11 FF and 6 recoveries in his 2 season career. This kid will have the support he needs to succeed. Between Patrick Peterson and Deion Sanders backing him up. I very much am expecting a trade back to later 3nd or early round 3. Moving back just 10 spots or less could net us another 4th. The draft cant come soon enough. late 2nd, not late 3rd. Droping 10 spots puts us at 66 Christian Michaels or Quinton Patton and we get that teams middle round 4th pick. I say ya i’m all in. Just need to find that someone who wants to trade. true, and I think JSPC will find that team, they have found partners in the draft ahead of time in the past. Once in the first, 2 times in the second, and many times later on. With the #14 pick in 2010 they had a trade partner to move back, but chose not to because ET was worth to much for them to possibly miss out. It will be the same senario this year. If they have true value at 56 they will take it, or else they will move back a few and get the guy they want anyway. They didn’t get the trade they was looking for at 25 so they choose Carpenter but they always have a backup plan. Kendricks gone grab Wagner. They always seem to be looking at what if and if it work great if not we got another option. Completely agree. Even a late 4th or 5th round pick carries a ton of value this year. That’s a lot of incentive for Seattle move down. I don’t think Seattle will worry about having too many picks. Yeah, I had this thought like a month ago on this site, and was shot down by most. The belief was that Seattle would have too many picks that would not make the team. I argued otherwise and still am hoping they do go that route. I think I even did a mock back then representing the extra picks. Glad Davis Hsu wrote an article on it though, as more people seem to agree with the option to trade down from pick 56. Tim Ruskell drafted like he wanted every pick to make the team. John Schneider drafts like he wants the players that make the team to make pro-bowls. Ironically, it’s been Schneider that’s had the better retention rate, though the genius of Pete Carroll plays a huge role in that. This regime isn’t focused on the players that miss the cut. Kris Durham was a flop, but without that extra pick to get him, they are likely drafting Kris Durham in the 5th instead of Richard Sherman. Think about that. I hope we go WR/TE/RB in rounds two and three. A safety or WLB in 4 would be nice too. In PART 1 Kip, I was glad to see that you’re high on Vance McDonald. Do you really think he could go as high as round two and if so why? I was hoping he would be available in round 3. Two names that jumped off the list of visits for me where, Kyle Juszczyk and Mike Catapano. Are you hot or cold on these two and if so what round do you see the hawks taking them? Ryan Often was recovering from a staph infection while at the combine and lost a lot of weight, tough kid if you ask me. Wanted to get an opinion on the possibility of R. Woods being there at 56. Would the hawks consider him? Why are some people hoping to move down for more picks? PC already said they can’t fit the 10 picks they have now on their roster. I am promoting that they move up 8-10 picks in rd 2, and consolodate their remaining picks to only 4-5 total, getting higher talent instead of quantity. I think Duke Williams would be perfect for the OLB position, or a backup for Cam. maybe he could be choosen with the 5th pick.